We'll go through several examples using the Scheme interface that demonstrate the process of computing fields, transmittance/reflectance spectra, and resonant modes. The examples are 1d or 2d calculations, simply because they are quicker than 3d and they illustrate most of the essential features. For more advanced functionality involving 3d computations with a focus on technology applications, see the Simpetus projects page. In order to convert the HDF5 output files of Meep into images of the fields, this tutorial uses the h5utils package. You could also use any other package (i.e., Octave or Matlab) that supports reading HDF5 files. The use of Meep revolves around the script (or control) file, abbreviated "ctl" and typically called something like foo.ctl. The script file specifies the geometry, the current sources, the outputs computed, and everything else specific to your calculation. Rather than a flat, inflexible file format, however, the script file is actually written in a scripting language. This means that it can be everything from a simple sequence of commands setting the geometry, etcetera, to a full-fledged program with user input, loops, and anything else that you might need. Don't worry, though — simple things are simple and you don't need to be an experienced programmer. You will appreciate the flexibility that a scripting language gives you: e.g., you can input things in any order, without regard for whitespace, insert comments where you please, omit things when reasonable defaults are available, etc. Scheme: a programming language developed at MIT. The syntax is particularly simple: all statements are of the form (function arguments...). We run Scheme under the Guile interpreter which is designed to be plugged into programs as a scripting and extension language. You don't need to know much Scheme for a basic script file, but it is always there if you need it. For more details, see Guile and Scheme Information. libctl: a library built on top of Guile to simplify protocols for scientific computation. libctl sets the basic tone of the interface and defines a number of useful functions (such as multi-variable optimization, numeric integration, and so on). See the libctl documentation. Meep itself, which defines all the interface features that are specific to FDTD calculations. This manual is primarily focused on documenting these features. At this point, please take a moment to leaf through the libctl tutorial to get a feel for the basic style of the interface, before we get to the Meep-specific stuff below. MPB has a similar interface. which reads foo.ctl and executes it, saving the output to the file foo.out. However, if you invoke meep with no arguments, you are dropped into an interactive mode in which you can type commands and see their results immediately. You can paste in the commands from the tutorial as you follow it and see what they do. For our first example, let's examine the field pattern excited by a localized CW source in a waveguide — first straight, then bent. The waveguide will have frequency-independent ε=12 and width 1 μm. The unit length in this example is 1 μm. See also Units. The simulation script is in examples/straight-waveguide.ctl. The name geometry-lattice comes from MPB, where it can be used to define a more general periodic lattice. Although Meep supports periodic structures, it is less general than MPB in that affine grids are not supported. set! is a Scheme command to set the value of an input variable. The last no-size parameter indicates that the cell has no size in the z direction, i.e. it is two-dimensional. We can add the waveguide. Most commonly, the structure is specified by a list of geometric-objects, stored in the geometry variable. 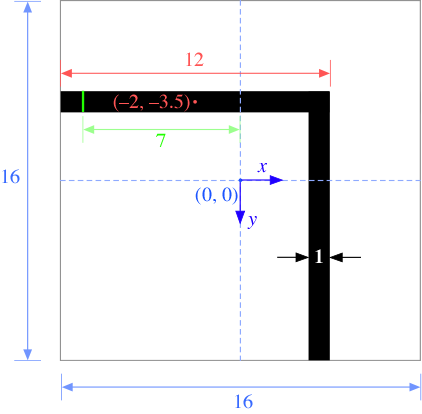 The waveguide is specified by a block (parallelepiped) of size , with ε=12, centered at (0,0) which is the center of the cell. By default, any place where there are no objects there is air (ε=1), although this can be changed by setting the default-material variable. The resulting structure is shown below. We gave the source a frequency of 0.15, and specified a continuous-src which is just a fixed-frequency sinusoid that by default is turned on at =0. Recall that, in Meep units, frequency is specified in units of 2πc, which is equivalent to the inverse of the vacuum wavelength. Thus, 0.15 corresponds to a vacuum wavelength of about 1/0.15=6.67 μm, or a wavelength of about 2 μm in the ε=12 material — thus, our waveguide is half a wavelength wide, which should hopefully make it single mode. In fact, the cutoff for single-mode behavior in this waveguide is analytically solvable, and corresponds to a frequency of 1/2√11 or roughly 0.15076. Note also that to specify a Jz, we specify a component (e.g. if we wanted a magnetic current, we would specify Hx, Hy, or Hz). The current is located at (-7,0), which is 1 μm to the right of the left edge of the cell — we always want to leave a little space between sources and the cell boundaries, to keep the boundary conditions from interfering with them. pml-layers is a list of pml objects — you may have more than one pml object if you want PML layers only on certain sides of the cell, e.g. (make pml (thickness 1.0) (direction X) (side High)) specifies a PML layer on only the side. We note an important point: the PML layer is inside the cell, overlapping whatever objects you have there. So, in this case our PML overlaps our waveguide, which is what we want so that it will properly absorb waveguide modes. The finite thickness of the PML is important to reduce numerical reflections. For more information, see Perfectly Matched Layer. Meep will discretize this structure in space and time, and that is specified by a single variable, resolution, that gives the number of pixels per distance unit. We'll set this resolution to 10 pixels/μm, which corresponds to around 67 pixels/wavelength, or around 20 pixels/wavelength in the high-index material. In general, at least 8 pixels/wavelength in the highest dielectric is a good idea. This will give us a 160×80 cell. We are outputting the dielectric function and the electric-field component , but have wrapped the output functions which would otherwise run at every time step in at-beginning and at-end, which do just what they say. There are several other such functions to modify the output behavior — and you can, of course, write your own, and in fact you can do any computation or output you want at any time during the time evolution and even modify the simulation while it is running. It should complete in a few seconds. If you are running interactively, the two output files will be called eps-000000.00.h5 and ez-000200.00.h5 (notice that the file names include the time at which they were output). If we were running a tutorial.ctl file, then the outputs will be tutorial-eps-000000.00.h5 and tutorial-ez-000200.00.h5. In any case, we can analyze and visualize these files with a wide variety of packages that support the HDF5 format, including our own h5utils, and in particular the h5topng program to convert them to PNG images. We see that the the source has excited the waveguide mode, but has also excited radiating fields propagating away from the waveguide. At the boundaries, the field quickly goes to zero due to the PML layers. If we look carefully, we see something else — the image is "speckled" towards the right side. This is because, by turning on the current abruptly at , we have excited high-frequency components (very high order modes), and we have not waited long enough for them to die away; we'll eliminate these in the next section by turning on the source more smoothly. Note that we have two blocks, both off-center to produce the bent waveguide structure pictured at right. As illustrated in the figure, the origin (0,0) of the coordinate system is at the center of the cell, with positive being downwards in h5topng, and thus the block of size 121 is centered at (-2,-3.5). Also shown in green is the source plane at which is shifted to so that it is still inside the waveguide. There are a couple of items to note. First, a point source does not couple very efficiently to the waveguide mode, so we'll expand this into a line source the same width as the waveguide by adding a size property to the source. An eigenmode source can also be used which is described in Tutorial/Optical Forces. Second, instead of turning the source on suddenly at t=0 which excites many other frequencies because of the discontinuity, we will ramp it on slowly. Meep uses a hyperbolic tangent (tanh) turn-on function over a time proportional to the width of 20 time units which is a little over three periods. Finally, just for variety, we'll specify the vacuum wavelength instead of the frequency; again, we'll use a wavelength such that the waveguide is half a wavelength wide. This is similar to the command before, with two new options: -t 0:332 outputs images for all time indices from 0 to 332, i.e. all of the times, and the the -R flag tells h5topng to use a consistent color scale for every image instead of scaling each image independently. Then, we have to convert these images into an animation in some format. For this, we'll use the free ImageMagick convert program and there are other tools that work as well. It is clear that the transmission around the bend is rather low for this frequency and structure — both large reflection and large radiation loss are clearly visible. Moreover, since we are operating just barely below the cutoff for single-mode behavior, we are able to excite a second leaky mode after the waveguide bend, whose second-order mode pattern (superimposed with the fundamental mode) is apparent in the animation. At right, we show a field snapshot from a simulation with a larger cell along the direction, in which you can see that the second-order leaky mode decays away, leaving us with the fundamental mode propagating downward. Instead of doing an animation, another interesting possibility is to make an image from a slice. 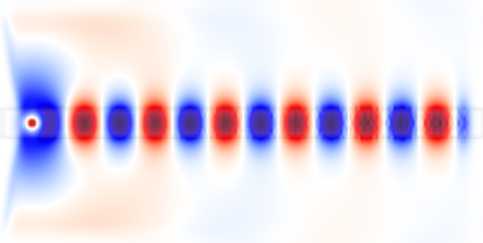 Here is the slice, which gives us an image of the fields in the first waveguide branch as a function of time. The -0y -35 specifies the slice, where we have multiplied by 10 (our resolution) to get the pixel coordinate. Above, we outputted the full 2d data slice at every 0.6 time units, resulting in a 69MB file. This is not large but you can imagine how big the output file would get if we were doing a 3d simulation, or even a larger 2d simulation — one can easily generate gigabytes of files, which is not only wasteful but is also slow. Instead, it is possible to output more efficiently if you know what you want to look at. will output a PNG file file every 0.6 time units, which can then be combined with convert as above to create a movie. The movie will be similar to the one before, but not identical because of how the color scale is determined. Before, we used the -R option to make h5topng use a uniform color scale for all images, based on the minimum/maximum field values over all time steps. That is not possible because we output an image before knowing the field values at future time steps. Thus, what output-png does is to set its color scale based on the minimum/maximum field values from all past times — therefore, the color scale will slowly "ramp up" as the source turns on. This will put all of the output files (.h5, .png, etcetera) into a newly-created subdirectory, called by default filename-out/ if our script file is filename.ctl. The first argument to in-volume is a volume, specified by (volume (center ...) (size ...)), which applies to all of the nested output functions. Note that to-appended, at-every, and in-volume are cumulative regardless of what order you put them in. This creates the output file ez-slice.h5 which contains a dataset of size 160x333 corresponding to the desired slice. We have computed the field patterns for light propagating around a waveguide bend. While this can be visually informative, the results are not quantitatively satisfying. We'd like to know exactly how much power makes it around the bend (transmittance), how much is reflected (reflectance), and how much is radiated away (scattered loss). How can we do this? The basic principles are described in Introduction. The computation involves keeping track of the fields and their Fourier transform in a certain region, and from this computing the flux of electromagnetic energy as a function of ω. Moreover, we'll get an entire spectrum of the transmittance in a single run, by Fourier-transforming the response to a short pulse. However, in order to normalize the transmitted flux by the incident power to obtain the transmittance, we'll have to do two runs, one with and one without the bend (i.e., a straight waveguide). The simulation script is in examples/bend-flux.ctl. We proceed to define the geometry, as before. This time, however, we really want two geometries: the bend, and also a straight waveguide for normalization. We could do this with two separate script files, but that is annoying. Instead, we'll define a parameter no-bend? which is true for the straight-waveguide case and false for the bend. We define the geometry via two cases, with an if statement — the Scheme syntax is (if predicate? if-true if-false). Thus, if no-bend? is true we make a single block for a straight waveguide, and otherwise we make two blocks for a bent waveguide. The source is a gaussian-src instead of a continuous-src, parameterized by a center frequency and a frequency width (the width of the Gaussian spectrum), which we'll define via define-param as usual. Finally, we have to specify where we want Meep to compute the flux spectra, and at what frequencies. This must be done after specifying the geometry, sources, resolution, etcetera, because all of the field parameters are initialized when flux planes are created. As described in Introduction, the flux is the integral of the Poynting vector over the specified flux-region. It only integrates one component of the Poynting vector and the direction property specifies which component. In this example, since the flux-region is a line, the direction is its normal by default which therefore does not need to be explicitly defined. We compute the fluxes through a line segment twice the width of the waveguide, located at the beginning or end of the waveguide. Note that the flux lines are separated by 1 μm from the boundary of the cell, so that they do not lie within the absorbing PML regions. Again, there are two cases: the transmitted flux is either computed at the right or the bottom of the cell, depending on whether the waveguide is straight or bent. The fluxes will be computed for nfreq=100 frequencies centered on fcen, from fcen-df/2 to fcen+df/2. That is, we only compute fluxes for frequencies within our pulse bandwidth. This is important because, far outside the pulse bandwidth, the spectral power is so low that numerical errors make the computed fluxes useless. This uses a file called refl-flux.h5, or actually bend-flux-refl-flux.h5 (the script file name is used as a prefix) to store/load the Fourier transformed fields in the flux planes. The (run-sources+ 500) runs the simulation until the Gaussian source has turned off (which is done automatically once it has decayed for a few standard deviations), plus an additional 500 time units. stop-when-fields-decayed takes four arguments: (stop-when-fields-decayed dT component pt decay-by). What it does is, after the sources have turned off, it keeps running for an additional dT time units every time the given |component|2 at the given point has not decayed by at least decay-by from its peak value for all times within the previous dT. In this case, dT=50, the component is Ez, the point is at the center of the flux plane at the end of the waveguide, and decay-by=0.001. So, it keeps running for an additional 50 time units until the square amplitude has decayed by 1/1000 from its peak. This should be sufficient to ensure that the Fourier transforms have converged. This is comma-delimited data, which can easily be imported into any spreadsheet or plotting program (e.g. Octave/Matlab): the first column is the frequency, the second is the transmitted power, and the third is the reflected power. What are we plotting here? The transmittance is the transmitted flux (second column of bend.dat) divided by the incident flux (second column of bend0.dat), to give us the fraction of power transmitted. 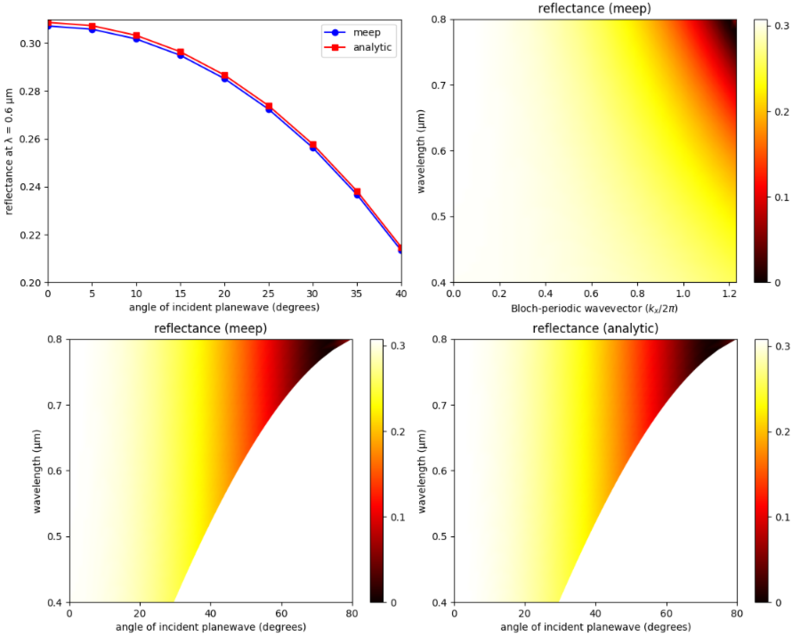 The reflectance is the reflected flux (third column of bend.dat) divided by the incident flux (second column of bend0.dat). We also have to multiply by -1 because all fluxes in Meep are computed in the positive-coordinate direction by default, and we want the flux in the direction. Finally, the scattered loss is simply . Again, we must run both simulations in order to get the normalization right. The results are included in the plot above as dotted lines — you can see that the numbers have changed slightly for transmittance and loss, probably stemming from interference between light radiated directly from the source and light propagating around the waveguide. We turn to a similar but slightly different example for which there exists an analytic solution via the Fresnel equations: computing the broadband reflectance spectrum of a planar air-dielectric interface for an incident planewave over a range of angles. Similar to the previous example, we will need to run two simulations: (1) an empty cell with air/vacuum (n=1) everywhere to obtain the incident flux, and (2) with the dielectric (n=3.5) interface to obtain the reflected flux. For each angle of the incident planewave, a separate simulation is necessary. A 1d cell must be used since a higher-dimensional cell will introduce artificial modes due to band folding. We will use a Gaussian source spanning visible wavelengths of 0.4 to 0.8 μm. Unlike a continuous-wave (CW) source, a pulsed source turns off. This enables a termination condition of when there are no fields remaining in the cell (due to absorption by the PMLs) via the run function stop-when-fields-decayed, similar to the previous example. Creating an oblique planewave source typically requires specifying two parameters: (1) for periodic structures, the Bloch-periodic wavevector via k-point, and (2) the source amplitude function amp-func for setting the spatial dependence ( is the position vector). Since we have a 1d cell and the source is at a single point, it is not necessary to specify the source amplitude (see this 2d example for how this is done). The magnitude of the Bloch-periodic wavevector is specified according to the dispersion relation formula for a planewave in homogeneous media with index n: . As the source in this example is incident from air, is simply equal to the frequency ω (the minimum frequency of the pulse which excludes the 2π factor). Note that a fixed wavevector only applies to a single frequency. Any broadband source is therefore incident at a specified angle for only a single frequency. This is described in more detail in Section 4.5 ("Efficient Frequency-Angle Coverage") in Chapter 4 ("Electromagnetic Wave Source Conditions") of the book Advances in FDTD Computational Electrodynamics: Photonics and Nanotechnology. In this example, the plane of incidence which contains and the surface normal vector is . The source angle θ is defined in degrees in the counterclockwise (CCW) direction around the axis with 0 degrees along the + axis. In Meep, a 1d cell is defined along the direction. When is not set, only the Ex and Hy field components are permitted. A non-zero results in a 3d simulation where all field components are allowed and are complex (the fields are real, by default). 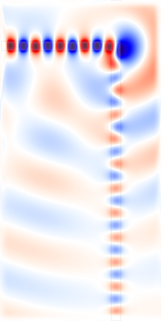 A current source with Ex polarization lies in the plane of incidence and corresponds to the convention of -polarization. In order to model the -polarization, we must use an Ey source. This example involves just the -polarization. The simulation script above computes and prints to standard output the reflectance at each frequency. Also included in the output is the wavevector component and the corresponding angle for the (, ω) pair. For those frequencies not equal to the minimum frequency of the source, this is not the same as the specified angle of the incident planewave, but rather sin-1(kx/ω). The following Bash shell script runs the simulation for the wavelength range of 0 to 80 in increments of 5. For each run, the script pipes the output to one file and extracts the reflectance data to a different file. Two-dimensional plots of the angular reflectance spectrum based on the simulated data and the analytic Fresnel equations are generated using the Octave/Matlab script below. The plots are shown in the accompanying figure with four insets. 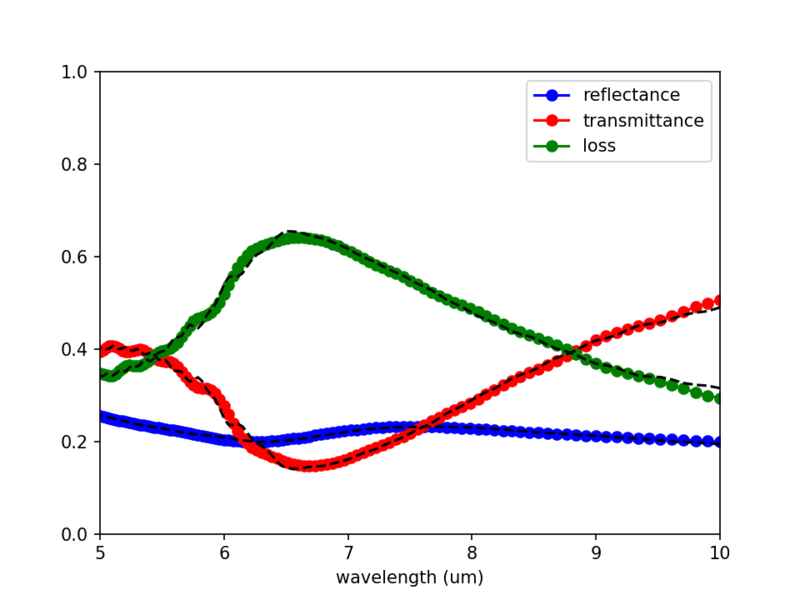 The top left inset shows the simulated and analytic reflectance spectra at a wavelength of 0.6 μm. The top right inset shows the simulated reflectance spectrum as a function of the wavelength λ and wavevector : . The lower left inset is a transformation of into . Note how the range of angles depends on the wavelength. For a particular angle, the reflectance is a constant for all wavelengths due to the dispersionless dielectric. The lower right inset is the analytic reflectance spectrum computed using the Fresnel equations. There is agreement between the simulated and analytic results. The Brewster's angle, where the transmittance is 1 and the reflectance 0, is tan-1(3.5/1)=74.1°. This is also verified by the simulated results. In order to generate results for the missing portion of the reflectance spectrum (i.e., the white region), we will need to rerun the simulations for different wavelength spectra. As described in Introduction, another common task for FDTD simulation is to find the resonant modes — frequencies and decay rates — of some cavity structure. You might want to read that again to recall the basic simulation strategy. We will show how this works for a ring resonator, which is simply a waveguide bent into a circle. This script can be also found in examples/ring.ctl. In fact, since this structure has cylindrical symmetry, we can simulate it much more efficiently by using cylindrical coordinates, but for illustration here we'll just use an ordinary 2d simulation. Later objects in the geometry list take precedence over (lie "on top of") earlier objects, so the second air (ε=1) cylinder cuts a circular hole out of the larger cylinder, leaving a ring of width w.
is the number of optical periods for the energy to decay by , and 1/ is the fractional bandwidth at half-maximum of the resonance peak in Fourier domain. This is the third column of the output. The fourth and fifth columns are the absolute value and complex amplitudes . The last column is a crude measure of the error in the frequency (both real and imaginary). If the error is much larger than the imaginary part, for example, then you can't trust the to be accurate. Note: this error is only the uncertainty in the signal processing, and tells you nothing about the errors from finite resolution, finite cell size, and so on. An interesting question is how long should we run the simulation, after the sources are turned off, in order to analyze the frequencies. With traditional Fourier analysis, the time would be proportional to the frequency resolution required, but with harminv the time is much shorter. For example, there are three modes. The last has a of 1677, which means that the mode decays for about 2000 periods or about 2000/0.175 = 104 time units. We have only analyzed it for about 300 time units, however, and the estimated uncertainty in the frequency is 10-7 (with an actual error of about 10-6, from below). In general, you need to increase the run time to get more accuracy, and to find very high values, but not by much. In some cases, modes with of around 109 can be found with only 200 periods. In this case, we found three modes in the specified bandwidth, at frequencies of 0.118, 0.147, and 0.175, with corresponding values of 81, 316, and 1677. As was shown by Marcatilli in 1969, the of a ring resonator increases exponentially with the product of ω and ring radius. Suppose that we want to actually see the field patterns of these modes. No problem: we just re-run the simulation with a narrow-band source around each mode and output the field at the end. Each of these modes is, of course, doubly-degenerate according to the representations of the symmetry group. The other mode is simply a slight rotation of this mode to make it odd through the axis, whereas we excited only the even modes due to our source symmetry. Equivalently, one can form clockwise and counter-clockwise propagating modes by taking linear combinations of the even/odd modes, corresponding to an angular dependence for m=3, 4, and 5 in this case. which differs by about 10-6 from the earlier estimate; the difference in is, of course, larger because a small absolute error in ω gives a larger relative error in the small imaginary frequency. This tells Meep to exploit a mirror-symmetry plane through the origin perpendicular to the direction. Meep does not check whether your system really has this symmetry — you should only specify symmetries that really preserve your structure and your sources. Everything else about your simulation is the same: you can still get the fields at any point, the output file still covers the whole ring, and the harminv outputs are exactly the same. Internally, however, Meep is only doing computations with half of the structure, and the simulation is around twice as fast. In general, the symmetry of the sources may require some phase. For example, if our source was in the direction instead of the direction, then the source would be odd under mirror flips through the axis. We would specify this by (make mirror-sym (direction Y) (phase -1)). See User Interface for more symmetry possibilities. In this case, we actually have a lot more symmetry that we could potentially exploit, if we are willing to restrict the symmetry of our source/fields to a particular angular momentum (i.e. angular dependence ). See also Tutorial/Ring Resonator in Cylindrical Coordinates for how to solve for modes of this cylindrical geometry much more efficiently. The previous examples were based on a 1d or 2d cell in which the structures and fields can be visualized using h5topng of the h5utils package. In order to visualize 3d structures, you can use Mayavi. 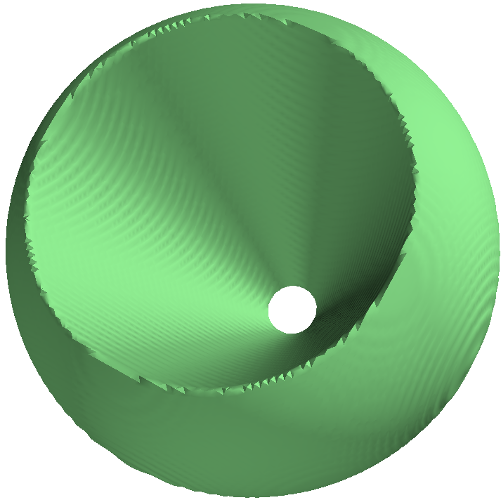 The following example, which includes a simulation script and shell commands, involves a sphere with index 3.5 perforated by a conical hole. There are no other simulation parameters specified. The permittivity data is written to an HDF5 file using output-epsilon. The HDF5 data is then converted to VTK using h5tovtk. VTK data can be visualized using Mayavi or Paraview via the IsoSurface module. Incidentally, emacs scripts are written in "elisp," a language closely related to Scheme. If you don't use emacs (or derivatives such as Aquamacs), it would be good to find another editor that supports a Scheme mode. For example, jEdit is a free/open-source cross-platform editor with Scheme-syntax support. Another option is gedit. There is also a syntax highlighting feature for Meep/MPB.